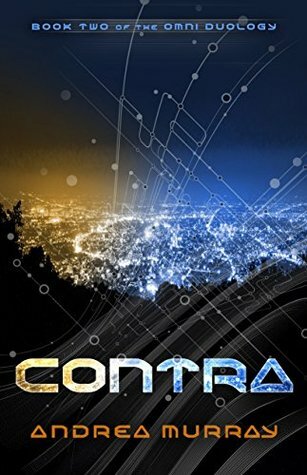 Hello and welcome to my tour stop for CONTRA by Andrea Murray! I have a review for you, plus there is a giveaway at the bottom of this post! In the sequel to the young adult dystopian novel, Omni, one young couple will do anything to stay together, and one man will do anything to control them. After barely escaping death in Omni, eighteen-year-old Pierce has left behind his place in the Artist stratum in exchange for sanctuary with his family. However, when Harmony goes missing, he can’t help but think it’s just another ploy of the Omni government to force him to return. With Harmony on her own, the two must find a way back to each other while battling against the full might of the government, but one powerful official is determined to keep them apart. Bent on revenge, Pelagic will stop at nothing to expose the secret of Pierce’s parentage. Disclaimer: I received a free copy of this book in exchange for an honest review. This was a satisfying conclusion to the duology. I liked that the basis of the myth was still there but that Murray took some liberties with it to make it her own. I think it was a really well constructed duology that is best read back to back as one novel. I really liked the re-imagining of the world and the way that the system was created -- I also really liked the characterizations and the choices that everyone made. But it did feel a little easy for some of the characters to get what they wanted. I read the Author's Note after and I understand WHY the characters were able to get off easy, but it kinda felt like a cop-out. I liked Pierce in this one, but I found him to be a bit whiny. But I think that's why I liked him? Because Harmony made him see how he was behaving and that it wasn't acceptable for him to treat her like a fragile possession. I also really liked that he opened up to more people this time around rather than closing himself off. I think it really expanded his character to have him accept new people and to try to build more relationships rather than be judgmental and always side-eyeing everyone who wanted to help him. Harmony was the best though. She took matters into her own hands to get what she wanted and didn't let anything or anyone stop her. I liked that she had a lot of agency to make her own choices, even if they weren't always the best. It made her feel like a real person rather than just a character or someone for Pierce to "obtain." I thought the side characters were still a little flat at times, but I liked that there was more going on than just what was happening in Pierce and Harmony's life. I think it added dimension to the story that everyone had their own story arc -- and while they all affected Pierce and Harmony, it wasn't strictly to make Pierce and Harmony's world better or worse. I would have liked a bit more from the "villains" in the story than what we got. They were ruthless in the first book, but definitely more passive in the second. I think I would have liked to see more of that ruthlessness in the second book as well. Overall I recommend this series to anyone who likes a good romance that spans across centuries! As well, this is such a unique reimagining of Greek myths, so if you like those, you will like this. Murray should rewrite more Greek myths in this world -- I would definitely buy and read all of them. Andrea Murray has been teaching English for longer than most of her students have been alive. She has taught everything from elementary reading groups to concurrent credit classes. She is currently teaching junior high language arts. She has a BSE and an MA in English. She lives in a very small town in Arkansas with her husband of nineteen years and their two children. 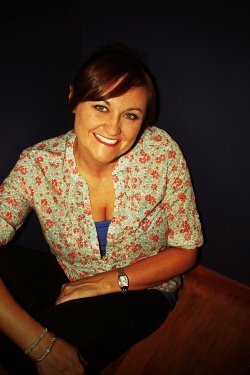 In addition to teaching, she also blogs on Chick Lit Plus, writes young adult fiction, and recently completed her fourth novel, Omni, a YA dystopian based on the story of Paris and Helen. Andrea has also written The Vivid Trilogy, a YA paranormal romance. When she isn’t doing that, she’s probably reading or watching bad B movies. Thanks for being part of the tour!